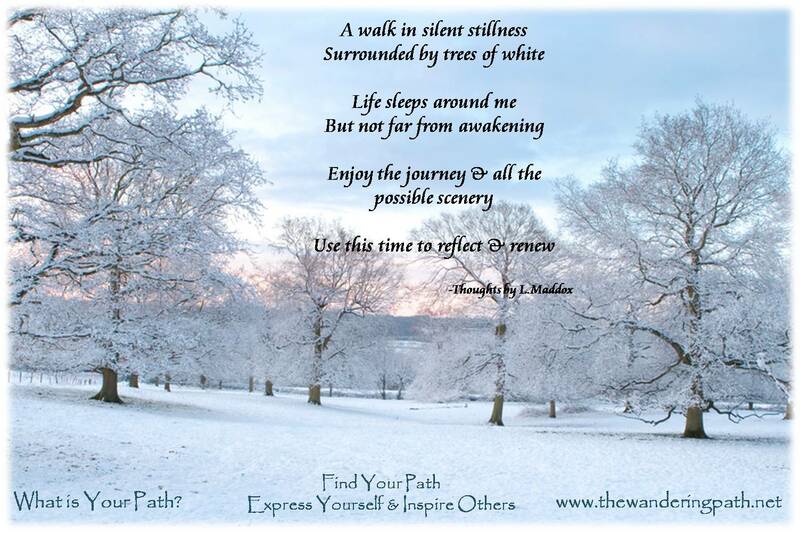 Hello Everyone, it’s Liza, the Owner of The Wandering Path. 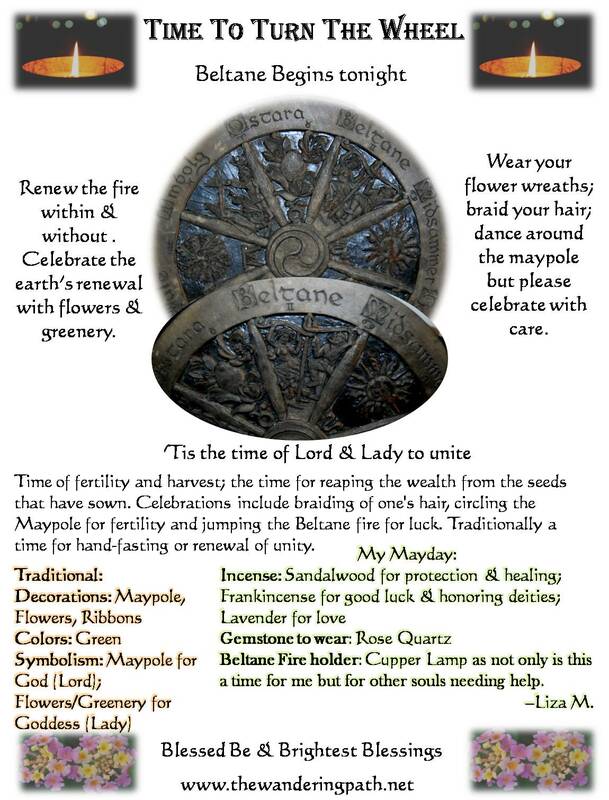 Beltane begins tonight and I hope those of you that celebrate it do so well. Renewal of spirit is how I view Beltane. The wheel in the photo is mine, and at each change I do turn this wheel so it’s now time to do so again. I see the earth renewing around me so it is time to renew the energies surrounding me. Please don’t take my graphic as all inclusive, but research and choose your tools that are appropriate for you. Incense types, gemstones, essential oils, fire holders etc….are all very personal and the response your energy & spirit have to them mean much more than what may work for others or what has been used in the past. I will be using my Nepali Butter Cupper lamp in memory of those I lost in the Nepal Earthquake as well as to those others that have passed through some violent nature lately. I will switch to one of my Plumeria candles later to tap into a very personal place that holds great sentiment for me to try to help my spirit renew. Best of luck to you all tonight & I hope this time is of great benefit to you. Brightest of Blessings to you and yours. With a raised mug–Liza M.
Could it be? Signs of Spring? The birds have begun to return here to Florida and temperatures are getting warmer. Spring will be here soon and this got us thinking…so we put together two Spring Special packages. We tried to think of what we have that could apply to everyone, so we put together two specials. One combination for the body and the other for the home (indoor and outdoor). 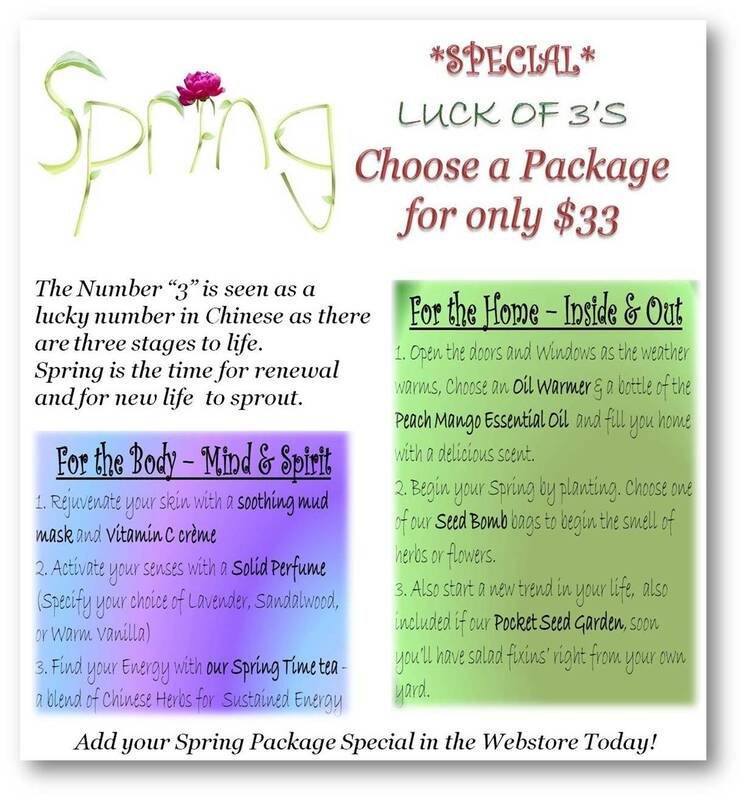 Please visit the Webstore today and purchase your Spring Special package….perhaps this will help mother nature allow Spring to arrive and winter begin to wane. – We hope your slide into the weekend proceeds fast and with as much ease as possible. – The Wandering Path Staff.